After a near-fatal beating in baseball and this month’s mayhem at an NFL preseason game, experts warn the perception of a rise in fan violence will give Americans reason to attend fewer games if leagues and clubs do not take action. Of 69,732 fans at this month’s Oakland Raiders-San Francisco 49ers NFL game, 70 were ejected from Candlestick Park, 12 were arrested, two were shot in the parking lot — and one was savagely beaten in a restroom. Images of the violence, proliferating through social and news media, struck a foul chord with fans and with stadium operators, many setting security policies without uniform guidance. Last season, the NFL averaged three arrests and 25 ejections per stadium per week, framing the recent events in San Francisco as a startling deviation. The NFL has noticed. Monday, the league and the Raiders released photos showing fans, including families, enjoying themselves at Sunday’s game against the visiting New Orleans Saints. “Perception + reality, often not the same,” NFL spokesman Greg Aiello wrote on Twitter. •Rivalry games spark animosity among fans. Add in tailgating and the accompanying uninhibited alcohol consumption and incidents can happen. •That can spawn the mob mentality. “Negative actions can become viral when one event — a limited act of violence occurs in the stands — triggers similar events in other areas of the crowd,” said Don Forsyth, professor of social psychology at the University of Richmond who has written extensively on fan behavior. •Not to be overlooked is fallout from a stumbling economy. •Rising ticket prices can create troublemakers out of haves and have-nots alike. Adding alcohol, Smith said, doesn’t help. Reed agrees. Each league’s reliance on beer and liquor sales varies, Ganis said. By his count, an NFL team’s alcohol revenue generally falls below $1 million in a season. Likewise, the parking revenue, derived in part from tailgating, maxes around $500,000. Ganis cites the rash of postgame drunk driving and lawsuits in the late 1990s as why clubs implemented stricter ID policies and seventh inning sales cutoffs — up to a point. But no matter what teams make from alcohol, the real money, Ganis said, is in providing a safe and enjoyable environment. “Further limiting alcohol would be another way of reducing fan enjoyment,” Ganis said. “You want to let the fans who want to have a couple beers do so as part of their fan experience without having the excessive drinkers ruin the event or make it feel unsafe for everybody else. NFL Commissioner Roger Goodell has been searching for that balance since his appointment in 2006. The league introduced a fan Code of Conduct in 2008 with an evolving list of best practices for stadiums, and a committee to oversee it. They perform fan surveys and weekly audits of every franchise and issue grades at the end of each season. Since 2008 the league has seen incident reports and ejections rise and arrests drop, indicating the problem is being “nipped in the bud” said Jeffrey Miller, the NFL’s director of strategic security services. But this month’s violence in San Francisco was “a clear sign that even though we do a lot, we need to do more — and we will do more,” Miller said. Officials with the 49ers decided that a healthy balance cannot be struck when the team meets the Raiders, at least not for now. Team president Jed York requested an end to the annual preseason meeting with the cross-bay rivals. Taking Miller’s advice, the security presence has been increased at Candlestick Park and its parking lots, and the team has banned tailgating after the game has begun. It was the kind of immediate action the 49ers had to take to restore confidence in their brand, said Jason Maloni, a senior vice president of Levick Strategic Communications, a Washington, D.C.-based crisis management firm that works with athletes and sports clubs. Social media makes us more aware of these incidents, Maloni said. After the Raiders-49ers fiasco, dozens of videos emerged on YouTube and other websites depicting fans trading blows in the stands, stadium corridors and parking lots. Although their “best practices” are not mandatory, the NFL said they are followed strictly by the franchises, with some taking extra steps to curb violence. The NFL Giants have cut alcohol sales altogether at some night games, with owner John Mara citing a desire to do “whatever it takes” to preserve a safe environment for fans. Miller said some of the measures taken in East Rutherford, N.J., and San Francisco aren’t necessary in other markets, and won’t be part of the league’s best practices. Dr. Stacey Hall, associate director of The National Center for Spectator Sports Safety and Security at the University of Southern Mississippi, said U.S. leagues can do more to be proactive. She points out the difference between crowd management and crowd control. Hall said U.S. venue staffs are lacking in both areas, especially compared to their counterparts in the United Kingdom, where fan violence stemming from hooliganism has produced national mandates for fan safety. In baseball, there is no such league-wide fan code of conduct or best practices committee. Most clubs voluntarily train with the non-profit Techniques for Effective Alcohol Management (TEAM Coalition), which is also involved with the NBA, NHL, NFL, NCAA and NASCAR. TEAM Coalition certifies stadium staffers in such training as recognizing the warning signs of impairment and enforcing underage drinking laws. Atlanta Braves third baseman Chipper Jones said he doesn’t bring his family to many road games because of the verbal abuse they endure, with alcohol consumption an added factor. He’s not sure increased security is the answer. Hall points to several technological measures that teams can take to help fans regulate themselves. In the NFL, every stadium has a text-messaging program so fans can notify security of a dangerous situation. In baseball and hockey, most but not all clubs have such technology in place. NBA spokesman Mark Broussard said the league does not make its security plans and policies public. Certain fans, however, will still make trouble. That attitude is still baffling to Jones, even after his 18 seasons in the big leagues. Contributing: Mike Dodd in Chicago, Michael McCarthy and Tom Pedulla in East Rutherford, N.J., Bob Nightengale in Baltimore, Steve Wieberg in Lawson, Mo. A season filled with unspeakable tragedy and unfortunate accidents both on and off the field finally has a potentially serious story with a very happy ending. Emmanuel Marlow, a 49-year-old Washington, D.C., native who works as a vendor at Nationals Park and other stadiums in the district, was making his normal rounds Thursday afternoon shortly after the start of a Washington Nationals game when he noticed a commotion in one of his sections. A young boy had begun choking on his food and those around him were panicking. According to a witness who first reported the heroic act to Dan Steinberg of the Washington Post, when Marlow came upon the scene and saw that no one else had taken charge, he immediately abandoned his vending duties and began performing the Heimlich maneuver. After two unsuccessful thrusts, Marlow remained calm and cool, and ensured the child’s mother he would be all right. On his third attempt, Marlow dislodged a piece of chicken from the child’s throat. After a quick examination at the stadium, the boy was deemed to be OK. His grateful mother went up to Marlow and spent 10 minutes hugging him, crying and thanking him for saving her son’s life. And then, just like that, Marlow went back to work. It’s concerning to hear how long the situation played out before someone — anyone — took charge to help the young child. And it’s very scary to consider what the outcome could have been if Marlow had not come along. I would strongly encourage anyone who has not been trained in performing the Heimlich, CPR and other life-saving procedures to consider taking the small amount of time it requires to either become certified, or simply become familiar enough to be comfortable taking action in a similar emergency. That’s what Marlow did; he once took a free CPR class at a local college, Steinberg writes, because he thought it might come in handy some day. And it might not surprise you to learn that Marlow’s “day” job begins at 3 a.m. and involves caring for patients with Parkinson’s disease. Marlow says it’s just in his nature to help people. You just never know when a similar situation will play out around you, or even involving someone you love. It’s always better to be safe and prepared than to be sorry. Right now, we’re all very thankful Emmanuel Marlow took the time and was prepared to do what was right. That is what makes a hero. A First Division Mexican soccer match was suspended on August 20th after gunmen opened fire on police outside the stadium in the city of Torreon. One officer was injured outside the stadium, and even though there was panic in the stadium, no other injuries were reported. There was a great article in August 29, 2011 issue of Sports Illustrated focused on the assault outside Dodgers Stadium this year. The article highlighted the various problems the Dodgers faced as well as some of the solutions they had undertaken. The Dodgers had 457 security personnel opening day including 195 uniformed LAPD officers. This season opening day they has one security employee for every 122 fans. According to the article arrests were down opening day from 132 last year to 72 this year. One problem highlighted by the article was that it took more than ten minutes for security to arrive in the parking lot after the attack. The next home stand was a different story with the help of Kroll the Dodgers brought in behavior detection officers trained to seek out belligerent fans, added improved lighting in the parking lots, and have announced plans to implement computer mapping technology used in crime prevention. The latest sport violence scene unleashed itself Saturday at Candlestick Park in San Francisco, when the 49ers hosted the Oakland Raiders. Fights broke out in the stands. Two separate shooting incidents injured two separate people in the parking lot. Another man was savagely beaten in an upper-level bathroom inside the stadium. The Britrock band Skunk Anansie had the crowd hopping and gyrating when a sudden, fierce storm began pelting the main stage — and the thousands watching them — with rain and hail. The storm shredded the annual Pukkelpop outdoor rock festival Thursday evening, blowing down huge canvas tents, uprooting trees and flinging multistory metal scaffolding towers and racks of concert lights across the grounds. Organizers said five people were killed and 140 injured, 10 of them seriously. Toon van Wemmel, 26, a graphic designer from nearby Leuven, said “the hailstones came down so hard they caused bruises.” He and his partner ran away from the main stage, turned around and saw trees crashing down where they had stood less than a minute earlier. Officials said the dead were all Belgians, ranging in age from 15 to 59. They were not immediately identified. Officials canceled the last two days of the three-day Pukkelpop festival Friday and blamed unprecedented weather conditions in the town 80 kilometres east of Brussels. Hilde Claes, the mayor of Hasselt, spoke of a “nightmare” and said the town had never seen a storm like the one Thursday. “I have seen many tropical storms, but this was unprecedented,” said Chokri Mahassine, organizer of the annual festival that began in 1985. The storm lasted barely five minutes. As the sky darkened, some of the 60,000-strong festival crowd ran for shelter from the rain and hail into the tents of caterers and festival sponsors. But Mr. Claes said three huge tents buckled under the force of the wind and the weight of the hail, sending hundreds back outdoors. As tent poles buckled, canvas roofs shredded, flapping in tatters in the wind. Video showed panicked concertgoers crawling out from under the downed tents and running through fields of mud to safety. “We were dancing away and it (the shelter) caved in in the middle and people were screaming and running away,” one sodden young woman told Associated Press Television News. Dr. Pascal Vranckx of Jessa Hospital in Hasselt said many of the injured were hit on the head by flying or falling debris. The seriously wounded were taken to hospitals while others were treated at a local sports center. “There are still three patients in critical condition, fighting for their lives,” Dr. Vranckx told reporters. The storm sent thousands of mud-splattered youngsters, many shoeless, looking for train and bus transport home. Others stayed on the campground overnight, hoping the festival would resume Friday. Organizers deployed extra trains and buses to ferry the concertgoers home. Mr. Claes and Mr. Mahassine said they received no advance warning of the storm that struck about 6 p.m. — a claim disputed by the Belgian weather office and VRT, the country’s Dutch-language public broadcaster. VRT weather woman Sabine Hagedoren said alerts were issued for “intense rain and storm showers with a chance of hail and fierce wind gusts.” In an email to The Associated Press, she said an “orange” weather alert was issued — the second most serious. “Unfortunately we cannot predict in which region — let alone in which town or city — the most serious thunderstorms will occur. But, definitely, an alert was issued for severe thunderstorms,” she wrote. Belgian weather records show similarly powerful storms have struck eastern Belgium every year since 2008. Belgian Prime Minister Yves Leterme offered condolences to the families of the victims and said authorities would continue to help the injured. The festival featured internationally known acts, including Foo Fighters, Eminem and The Offspring. “Our hearts go out to everyone affected by the tragic events at Pukkelpop,” tweeted the Foo Fighters, whose Thursday night show was canceled after the storm hit. “This is not how it should be. Oof,” tweeted the Fleet Foxes, who had also been scheduled to play Thursday night. The band also used Twitter to assure family and fans that they were safe. Damien Poinen, an 18-year old Belgian, was one of the many who camped overnight. This was the second deadly incident at an outdoor festival in a week. On Saturday, parts of a stage collapsed at the Indiana State Fair in Indianapolis, killing six people and injuring dozens, when winds of up to 112 kilometres per hour hit. INDIANAPOLIS (AP) — The wind gust that toppled a stage at the Indiana State Fair Saturday night, killing five and injuring dozens of fans waiting for the country band Sugarland to perform, was a “fluke” that no one could have anticipated, the governor and others said Sunday. The wind was far stronger than that in other areas of the fairgrounds, said Dan McCarthy, chief meteorologist for the National Weather Service in Indiana. He estimated the gust at 60 to 70 mph. Gov. Mitch Daniels said precautions were taken before the storm, but no one could have foreseen such a strong gust focused in one place. Some witnesses have said that while a storm was expected, rain hadn’t begun to fall when the wind sent the stage rigging falling into the crowd of terrified fans. “This is the finest event of its kind in America, this is the finest one we’ve ever had, and this desperately sad, as far as I can tell fluke event doesn’t change that,” Daniels said. Four people were killed when the metal scaffolding that holds lights and other stage equipment fell, and a fifth died overnight at a hospital, Indiana State Police 1st Sgt. Dave Bursten said. Fair director Cindy Hoye said it was too soon to talk about who was responsible for the stage and its rigging because the investigation had just started, but she had confidence in Mid-America, the company that owns the stage. Mid-America did not respond to messages left Sunday. Concert-goers said opening act Sara Bareilles had finished performing and the crowd was waiting for Sugarland to take the stage when the storm hit just before 9 p.m. They said an announcer alerted them that severe weather was possible and gave instructions on what to do if an evacuation was necessary. But the announcer also said concert organizers hoped the show would go on, and many fans stayed put. Witnesses said dirt, dust, rain and wind came barreling up the fairground’s main thoroughfare minutes later and the stage collapsed. When a crowd crush killed 21 and injured hundreds at a German Love Parade last year, the finger of blame was pointed at organisers for not noticing a dangerous build-up of revellers. Now, in a bid to stop a tragedy like the one that struck Duisburg in July 2010 from occurring again, a new piece of software has been developed to detect when crowds are starting to build up to dangerous levels. By pre-empting the problem it will then give security staff the chance to disperse crowds to safety. Barbara Krausz, from the Fraunhofer Institute for Intelligent Analysis and Information Systems in Sankt Augustin, Germany, developed the system. She realised that, when people become trapped in a highly congested area, they sway slowly from side to side in an effort to keep their balance. This a great tool, but it is only a tool. There still needs to be a trained person to examine the computer and identify when swaying patrons are engaged in dancing or a posible crowd surge. 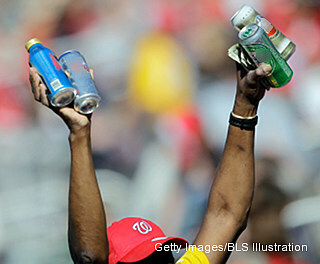 The NCAA has rules banning alcohol sales and advertising at its 88 championships. Furthermore, host sites must cover up alcohol related advertising. However, football fans at 20 major college venues will now be able to buy alcohol during regular season games. This number is twice as many schools as there were serving alcohol ten years ago. West Virginia is hoping to generate $1 million in profits from selling alcohol. For financially strapped athletic departments this could be a big financial windfall. Schools that currently allow alcohol sales include: Bowling Green, Cincinnati, Colorado State, Connecticut, Hawaii, Houston, Kent State, Louisiana-Lafayette, Louisville, Memphis, Miami, Nevada, Rice, San Diego State, South Florida, Syracuse, Temple, Tulane, UNLV, and West Virginia. A new layer of airport security aimed at screening passenger behavior will begin testing Tuesday at Boston’s Logan International Airport. The Transportation Security Administration will train screeners on sparking more conversations between screeners and passengers at Logan’s Terminal A security checkpoint — a first-in-the-nation initiative modeled after Israel’s enhanced airport screening methods. “TSA has long recognized the value of a layered, threat-based approach to transportation security and the need to focus more of our resources on people who potentially pose a threat to aviation safety in addition to the system’s current focus on high-risk items,” TSA spokesman Greg Soule told Fox News. Under the new program — part of a nearly $1 billion national program called the Screening Passengers by Observation Techniques, or SPOT — behavior officers will ask passengers non-intrusive questions and look to see how passengers respond. Those who exhibit suspicious behavior like avoiding eye contact and struggling with answers will be pulled aside for more screening. “The advanced training the officers receive includes both classroom and on-the-job experience designed to enhance their communication skills and engage in conversations with passengers to verify or dispel suspicious behavior and anomalies,” Soule said. Around 60 TSA officers are scheduled to take part in the training. Logan is the first airport in the nation to roll out the pilot program, which is targeted to officially begin in mid-August. TSA will evaluate how this pilot program impacts security, screening operations and passenger flow. The results will determine how the agency proceeds with the program.